The holiday season is behind us and the New Year is here. Now is a great time to take a look at the condition of your house and make plans for repairs and improvements. The elements and time can cause the outside of your home to look dull and rundown. If you want to refresh the exterior of your home this year there are a few different options. You can start by giving it a deep cleaning and then move on to repair any areas that are showing signs of damage or wear. Once your house is clean and the damage is repaired you can take things to the next level with a whole new paint job. It can be difficult to tell how dirty the exterior of your house really is until you start cleaning it. All year long your house is exposed to the elements. Dirt and grime can quickly build up and lead to a dull and discolored exterior. One of the most effective and efficient methods for cleaning the exterior of your house is pressure washing. Pressure washing uses a pressurized stream of water and cleaning solution to blast off built on dirt and grime. This method can be used on siding and brick as well as any of the concrete surfaces around your house. Homeowners are often delighted to see how much of an impact a good cleaning can make on the exterior of their home. Peeling paint, rotted siding and other types of exterior damage can cause your house to look run down. Addressing the damaged areas around your house can refresh the whole exterior. For cracked or peeling paint you need to remove the old paint before applying touch up. If you have spots on your siding that are rotting then the best option is to replace the damaged boards. Fixing areas of your exterior that are damaged will help refresh the whole look of your house. There are not many things that will transform the exterior of your home as dramatically as a whole new paint job. You can change the style of your home with paint choice or go with the same palette and make it look brand new. 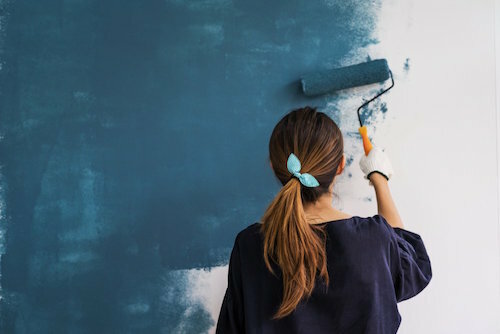 If you want to truly refresh the exterior of your house this New Year, a complete paint job will definitely do the trick. Any of the projects mentioned above can be handled by a professional painting company. If the exterior of your home is in relatively good shape start with getting it pressured washed and see what kind of difference it makes. This small project may have the impact you are looking for this New Year.